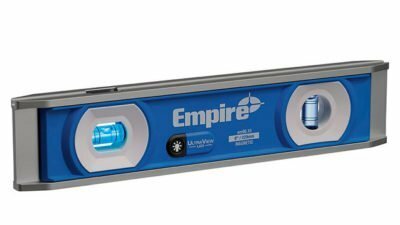 A level is a pretty simple tool so innovating it is a bit tricky, but that’s just what Empire has done with their UltraView LED Torpedo Level. For starters it has a ruler and pipe groove, which is compatible with any straight edge to extend the working surface for measuring and scribing. Tiny LEDs surround the vial, lighting it up in the darkest spots. And, because you have better things to think about, the automatic shut-off saves battery life by turning off LEDs after three minutes.